This blog was created to keep bluegrass people around the world informed of international bluegrass events and news. For general bluegrass news visit The Bluegrass Blog daily. Also updated regularly is EBMA's European Bluegrass Blog. The World International Bluegrass Band, which will be performing in the USA later this year and which we featured in recent news, has a forerunner. 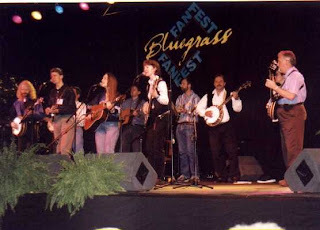 Erio Meili of the São Paulo Bluegrass Association has reminded us of the International Band that performed at the 1997 IBMA FanFest. The personnel included Claudio Vescovi (guitar; Milan, Italy), Erio Meili (banjo; São Paulo, Brazil), Helmut Mitteregger (mandolin; Vienna, Austria), Katarina Mitteregger (bass; Vienna, Austria), Katsyaki Miyasaki (mandolin; Kyoto, Japan), Marilyn Barclay (guitar; Munich, Germany), Markus Stadler (banjo; Munich, Germany), Monika Schwentner (mandolin; Zurich, Switzerland), Paul Graham (mandolin; Jerusalem, Israel), Richard Hawkins (banjo; Dublin, Ireland), Thierry Schoysman (banjo; Brussels, Belgium). Further research by EBMA's European Bluegrass Blog has uncovered that the group was assembled and organised for the performance by the late Eric Hoogstad of the Netherlands. 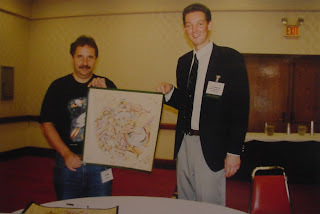 The picture below shows Eric (right) and Erio holding the framed artwork for the 1997 World of Bluegrass.